1 Put the gram flour, black Himalayan salt and almond milk in a jar and beat together to form a batter. Then set aside. 2 Put a oven proof frying pan on a medium to high heat then add the coconut oil. 3 When the coconut oil has melted, add the mushroom and red pepper then stir. 4 After about 30 seconds add the kale and a pinch of cracked black pepper and stir and cook for about 1 minute. 5 Then add some chives holding back 2 large pinches of chives for later. 6 Add the parmesan cheese in to the batter mixture, except for 2 pinch for later. 7 Pour the batter into the frying pan, making sure the mixture goes all the way to the bottom of the pan and all the ingredients are covered, sprinkle a pinch of the vegan cheese and one pinch of the chives on top. 8 Put the frying pan with omelette into a pre-heated over on 220c/450f/Gas 8 for 5- 10 minutes. Until it gets lightly coloured and set. 9 Put the rocket leaves on to a plate and add the tomatoes. Place the ingredients for the dressing in a jar then shake or place it in small jug and mix. 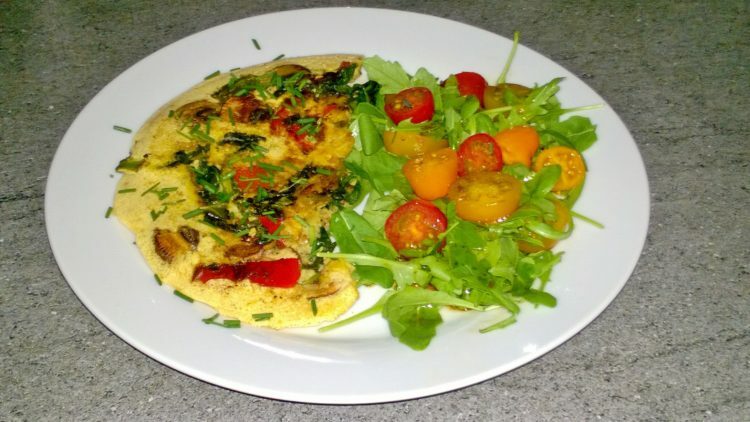 10 When the omelette is cooked remove remove from the oven then cut in half and place on the plate with the rocket salad and serve.